From “Heucq Father & Son” to “André Heucq”. 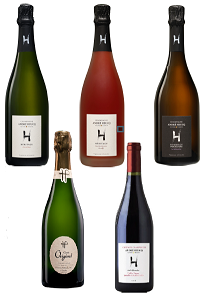 these evolutions, “André Heucq” affirms more our vine grower claim and our history. “4”, he refers to the four elements : earth, fire, water and air. These are our historic champagnes, inherited from our great-grandfather and have evolved over time and generations. Cuvees released from our vinotheque. Red wines from old vines with low yields, harvested late to benefit from a high concentration of aromas.